can anyone answer a reader's questions about student loans? If anyone has any info for "BS" from the US, she would be most appreciative. Email copied with her permission. ...we both have massive student loan debt to pay off. Our main concern is that my boyfriend owes much more than I do and his deferment period will end around the time that we expect to move to Toronto. He has also exhausted the income sensitive repayment period that is allowed on his loans. It's a long story, but he basically consolidated his undergrad and graduate school loans at a time when the interest rate was exceptionally high, so now the amount that he owes is more than double the original loan amount and we're worried that he won't be able to make the regular payments. It's going to be a tough situation, since neither of us make a lot of money and then there's the exchange rate to consider. We're not flakes and don't want to come off that way, but we need to know what the reality is going to be if he can't pay off his loans and we're living in another country. Some countries have reciprocal agreements regarding student loan debt, but we haven't been able to find any info online as to whether there's a reciprocal agreement between Canada and the U.S. and I'm not even sure where you're supposed to find this sort of information. If there is, then we need to know what the details of that agreement are, who takes responsibility for administering the debt, and if there is a possibility of renegotiating the terms of the loan. If there isn't an agreement and my boyfriend ends up defaulting on his loan, then we need to know what that means for us as Canadian residents, whether it will affect our ability to become citizens, if it will affect our Canadian credit record, etc. I'd appreciate it if you could ask around or maybe post something about it on your blog. . . I don't want it to come off like we're moving to Canada so that we can blow off our student loans and live high on the government hog. We just want to settle down in a country that reflects our political and cultural values, and that certainly isn't the United States. The most important thing is that we find some firsthand information from reliable sources. Every time the subject comes up with people here, they usually respond with a combination of horror and paranoia. something completely obvious. Hopefully one of your readers will be able to point us in the right direction. If you can help, or know someone who can, please give a shout, either in comments or by email. Thanks. I was pleased and relieved that Stephen Harper, on behalf of the Canadian government, finally apologized to Maher Arar. But when I read the actual text of the apology, I was disappointed - and annoyed. "On behalf of the government of Canada, I wish to apologize to you, Monia Mazigh and your family for any role Canadian officials may have played in the terrible ordeal that all of you experienced in 2002 and 2003. Although these events occurred under the last government, please rest assured that this government will do everything in its power to ensure that the issues raised by Commissioner O'Connor are addressed. I trust, having arrived at a negotiated settlement, we have ensured that fair compensation will be paid to you and your family. I sincerely hope that these words and actions will assist you and your family in your efforts to begin a new and hopeful chapter in your lives." "...for any role Canada may have played in the terrible ordeal that all of you experienced..."
That is not actually an apology. The government says it's an apology, and Arar and his representatives have accepted it as such. But it is not, in fact, an apology. An apology must include an acknowledgement of wrongdoing and an expression of regret. In other words, an apology must say "I (or in this case, we) did this" and it must say "we are sorry". A true apology would have stated: "...for the role that Canada played in the terrible ordeal..."
Harper's statement is the governmental equivalent of the neutral "I'm sorry you feel that way," or the passive "I'm sorry that harm was done to you". There is no admission that Canada did play a part in the "terrible ordeal". In fact, the statement implies that perhaps it did not. Perhaps there is another valid point of view. I'm interested in truth-telling, and in forgiveness, and how the two work together. Without truth-telling, true reconciliation cannot take place. And without reconciliation, there will always be a gap - an abscess - in the healing. Nevertheless, we've seen what truth-telling can accomplish, even on a governmental and national level. South Africa taught us that. I'm disappointed that Stephen Harper's government chose not to take that route. In a related story, I liked this essay about Dr Monia Mazigh, Maher Arar's wife. She is quite possibly the reason Arar is alive today - and the reason we know about "extrordinary rendition" in the first place. Mazigh's relentless fight to rescue her husband saved not only Arar, but was pivotal in rescuing Canada both from disgrace and succumbing to practices that would transform the relationship between the Canadian citizen and the state from one of relative trust to fear. In the Arar case, Canada as a country had started down a dark path. We must be vigilant to ensure that justice is quickly restored. We owe it to ourselves to punish the offenders, and to celebrate the heroes. As long as Canadian citizens refuse to surrender the rule of law in favour of some agenda-laden promise of security, they will be able to restrain these would-be hijackers. Mazigh understood that, and she understood that the brilliance of the rule of law is that before the law all are considered equal. Ultimately the state must serve those who act within the law and prosecute those who violate it, even if they hold government offices and wear the state's uniform. Too few Canadians appreciate just how powerful the rule of law makes them, and so too often allow themselves to be trodden upon. Those who would abuse the power of the state, as CSIS and the RCMP did, count upon such meekness. To their chagrin, Mazigh was neither ignorant nor meek. The writer compares Mazigh to Laura Secord, about whom I know very little. But I know that Monia Mazigh is a hero. New excavations near Stonehenge have uncovered hearths, timbers and other remains of what archaeologists say was probably the village of workers who erected the monoliths on Salisbury Plain in England. The archaeologists announced yesterday that the 4,600-year-old ruins appear to form the largest Neolithic village ever found in Britain. The houses at the site known as Durrington Walls were constructed in the same period that Stonehenge, less than two miles away, was built as a religious center, presumably for worshipers of the sun and for their ancestors. Mike Parker Pearson, a leader of the excavations from the University of Sheffield, said the discoveries last summer supported the emerging recognition that the ring of standing stones and earthworks at Stonehenge was part of a much larger religious complex. In a telephone conference conducted by the National Geographic Society, Dr. Parker Pearson said a circle of ditches and earthen banks at Durrington Walls enclosed concentric rings of huge timber posts, "basically a wooden version of Stonehenge." The excavations exposed not only the timber circle but also a roadway paved with stone leading to the Avon River, about 500 feet away, which was similar to a river road from Stonehenge. The evidence, Dr. Parker Pearson said, "shows us these two monuments were complementary" and that "Stonehenge was just one-half of a larger complex." For anyone who loves ancient sites as I do, that area of England is a gold mine. This is a really exciting development. I was fortunate enough to visit Stonehenge when you could still walk amongst and touch the stones. The next time I was there, with Allan, it was all roped off. We also went to Avesbury and other sites on Salisbury Plain, and it was still great. But there's nothing like standing among such ruins, placing your hands on them, feeilng that connection with the distant past. If you ever have an opportunity to visit Ireland, don't miss a trip to Newgrange, a neolithic passage tomb, older than Stonehenge, older than the Egyptian pyramids, that you can walk inside. Newgrange is in Ireland's Boyne Valley, home to many other neolithic sites. Like Stonehenge, Newgrange is oriented towards winter solstice, but in a very complex way. Every time I see stories like this, I want to take off for somewhere. Now I want to go back to England to see this unearthed village. This wanderlust plagues me. Everyone is sleeping - Allan in bed, Cody on her mat next to the bed, and Tala in her crate in the middle of the bedroom. But I must have had too much coffee yesterday, 'cause I'm wide awake. What better time to get caught up than 3:15 a.m. Yesterday was exhausting, but very joyous. I had an early-morning appointment, then we hit the road. Cody was in the back seat, of course. We were very fortunate with the weather - since we were driving into western New York State, serious snow country, it could have been an issue, but we only saw some flurries, and mostly it was clear. It's about three hours from our place to Churchville, New York. We met the trainer at the Husky Rescue house, and let Cody and Tala run around in the backyard together. Cody was wary, as she always is with dogs she doesn't know. But it gave them a chance to smell each other and for Cody to feel a tiny bit more comfortable. The trainer, who has also been Tala's foster mom for three months, demonstrated the commands Tala knows. Tala is obviously intelligent and eager to learn. We just nodded our way through the demonstration, knowing we would soon employ our own methods. These folks do amazing, life-saving work, rescuing hundreds of dogs from abuse, neglect or certain death in US shelters. They pay for medical care and neutering, they socialize and train the dogs, and they take great care to find each dog a loving, secure home. I admire and appreciate their work tremendously. We just feel their training methods are unnecessarily harsh. They don't hit and yell - it's not that bad. But their training involves a lot of jerking on a choke chain (which they refer to as a "training collar"), and intimidation and physical dominance to force the dog to obey. We don't believe any of that is necessary. We've learned extremely effective training techniques that are based on positive reinforcement, love and trust. This philosophy is grounded in the knowledge that a dog is not a machine that can obey every command, every time. When you're working with a dog - especially a young dog, who is really only a child - and the dog loses concentration, you take a break and pick up the training session later. Based on our first meeting with the Husky Rescue folks, we knew there was no point in discussing any of this. In fact, if we had, we might not have been given Tala. I already had the feeling they're not convinced we can handle her. So we decided to politely watch the demonstration of how to "make" Tala obey, knowing that this would be the last time Tala would have to put up with that. Up to now, Tala's leash training has involved a lot of pulling and jerking on a choke chain. But waiting for her at home was her brand new "Halti" head collar, the most humane and effective method of walking (and training) a dog I've ever seen. We have sworn by Haltis for nearly 20 years, since they were first invented by a veterinarian and sold only through mail-order. These collars literally changed my life, making it possible for me to walk our very strong, very big Shepherd-Husky mix - the beloved Gypsy - without having my shoulder pulled out of the socket. Later, at home, Allan tried to remove Tala's choke collar, and it barely fit it over her head. It must have been put on when she was first rescued - and completely emaciated - and they never got her a larger size. There was a raw pink ring around her neck. The choke collar went in the trash, and Tala had her first walk with the new Halti. So back in Churchville, we waited out the trainer, finished the paperwork, and got ready to go. This was also Tala's foster mom, so I know it must have been sad for her. Fortunately she has seven dogs of her own! Two weeks ago - in between moving and the Ice Hotel - we went shopping for new-dog supplies, including a barrier for the car. We never needed that in New York City! So Cody kept her comfy spot in the back seat, right behind us, and Tala travelled in the hatch back behind the barrier. Cody is an excellent passenger - you don't even know she's in the car - and it wouldn't be fair or safe to stick both dogs in the back seat together. Tala's trainer looked at the arrangement and said, "In ten minutes, she'll be in the back seat," and "You know she'll bark the whole way home". Tala spent 95% of the ride looking out the window, fascinated by the trucks going by on the highway. A few times, at the beginning, she tried to put her face through the barrier to check out Cody. After all, she was curious! I said, "Uh-uh, Tala - off," Cody gave her a quick growl and a dirty look, and Tala popped off to look at more trucks. The whole "incident" took five seconds. She never barked once. Here's something we learned yesterday that really surprised us: Tala had never been inside a house! Ever! Since being rescued, she's lived in a kennel - a lovely, clean, large kennel, but still, never a home. When we pulled onto the driveway yesterday evening, we knew that everything Tala would experience would be new and exciting to her. She wasn't at all frightened or intimidated. She was happy, eager, excited, hyper-alert. She skittered around smelling everything. When she'd jump up to get a better look at something, we told her a sharp "Off!" and she stopped. Her attention span was shorter than a flea's, her head whipping around at every little noise. Cody was wary, and intimidated. We had to encourage her to come in the room, to lay on her own mat, to eat dinner. But she also stood up for herself. When Tala was too encroaching, Cody backed her off with a quick growl. I don't know how long it will take for Cody to like Tala and bond with her. I know it will happen, but I don't know when. It looked like Tala had never seen stairs before. She didn't seem to know how to walk up or down stairs, or even what they were for. She would awkwardly walk up to the landing, walk around in a circle, then walk back down - not realizing the stairs actually went somewhere! Both dogs had dinner, and ran around in the backyard, then Tala watched with fascination as we heated up our own dinner and ate at the table. She had clearly never seen such a thing before. Then she had her first walk with her new Halti. Predictably, she shook her head around and pawed at her face a little, annoyed by the strangeness. A moment later, she settled down - and had her first walk without being choked. That device is a little miracle. Later in the evening, she spent a lot of time staring out of the living room window. We have a big picture window with a clear view to the street, and she was rapt. I'm sorry I was too tired to get the camera, but I have a feeling there'll be plenty of opportunities for that shot. After another quick out in the backyard, and lots of praise for doing what she was supposed to outside, we introduced Tala to the "treat before bed" ritual. She was totally confused. What is this? Why are you giving it to me? What am I supposed to do with it...? We had to coax Cody into the bedroom, but I was very relieved that she took her spot next to my side of the bed. That's relatively new for her. Naturally, it used to be Buster's spot, and Cody only claimed it a few months ago. (I hated not having a dog next to me at night!) I was hoping Cody would still sleep next to me, despite Tala's presence. At least last night she did. Tala wasn't overly thrilled about getting in her crate, but she soon settled in and curled up for the night. This is going to be quite a week. Now it's 4:20 and I think I can go back to sleep. I hope to blog about non-personal, non-dog subjects again. One day. Sign in to Blogger before you try to post anything. It seems to alleviate a lot of annoyances, such as invisible word verifications. We're off to Rochester to pick up Tala! Her foster mom tells me Tala is bouncing off the walls. She was recently spayed, then had a post-operative infection, and hasn't been able to run around and play in a week. We might be in a for a shock - it's been a long time since we've had a hyperactive puppy around here. We can't wait! And so the saga concludes. After all this back here, I realized one more thing (here). No choice was perfect, but at this point I saw that Blogger was now the choice with the least negatives. However... Blogger, as usual, has announced a new feature that they aren't really ready for, and don't fully support. If you are trying to use New Blogger with your own domain name, the instructions are here. But they don't work. First I had the usual tremendously frustrating experience trying to get good information from the Blogger Help Group. Some of the volunteers are patient and persistent, but, as they themselves admit, they're only guessing, learning as much from your experience as anything else. I got some blatantly wrong information - at one point someone told me I could either publish to www. คาสิโนออนไลน์ แจกเครดิตฟรี 2019 www.thetentsbrandbook.com or คาสิโนออนไลน์ แจกเครดิตฟรี 2019 www.thetentsbrandbook.com but not both! - plus there's a huge lag time between call and response. Eventually I gave up. I then worked with tech support from my DNS server, et voila! They fixed it. In case you want to go for this option, here's how I got it to work. 1. We'll assume you've already registered your own domain and have a DNS server. 2. Have a blog with a blogspot.com address. If you don't already have one, create one. I created wmtc.blogspot.com for the occasion. (That's where wmtc was hiding all weekend!) Don't try to go from FTP publishing to custom domain publishing on Blogger. I don't think it can be done. 3. When your blogspot URL is working properly, change your Blogger publishing settings to custom domain. 4. Then, at your DNS server, Blogger tells you to create a CNAME record pointing to ghs.google.com. Don't. Use URL forwarding to forward your old Blogspot domain to your custom domain. That's it. You should now be able to publish your own domain name to Blogger and use all the New Blogger features. I also want to recommend two excellent companies that I found during this ordeal. One is Laughing Squid, recommended to me by Matt the Nurse. Squid is a small, friendly hosting company with fast, responsive, personal, friendly and knowledgeable customer service. Their rates are extremely reasonable, their turnaround time is speedy, and their service is reliable. Unfortunately for me, they don't offer DNS-only hosting, so I reluctantly left. But they were great, and I recommend them highly. The other is easyDNS. EasyDNS is a Canadian company that can register a dot-ca domains* and offers both full hosting and DNS-only hosting. Over the weekend, frustrated beyond belief with Blogger, I noticed easyDNS had customer service phone support. I called the 800 number - and was shocked when a tech support person came on the line in less than a minute! He worked with me more than once, and although he was unfamiliar with Blogger's needs, he tried several different options to try to get my site up. He also offered to put my payment on hold, so that if I couldn't get what I needed, I could leave without being charged. Is that cool or what? The problems with Blogger continued into the night and the following morning. By noon I was super frustrated. On my lunch break, I called easyDNS again, again got through in under a minute, and after a ten-minute call, my problem was solved. The tech person told me that the service doesn't advertise, and depends on word-of-mouth. So here is some word-of-blog for them: use easyDNS. * Only certain companies can do this. And only Canadian companies, citizens or residents can get a dot-ca address! This blog is driving me insane. Insane, I tell you. If you're reading this, then hopefully everything is updated and I can soon upload the new design. This is not the new design. This is a plain white template with a few tweaks. If I had to look at the old design one more day, I would go even more insane. Insanier. I've got several posts in the works, but I'll give you a break while you catch up on previously invisible posts. Joni Mitchell will be inducted in the Canadian Songwriters Hall of Fame today. Although this Hall of Fame is only four years old, I'd say this honour is way overdue. Joni Mitchell is my idol. That doesn't mean I love all her music, although I do love a surprising amount of it, considering what a long and varied career she's had. I've listened to Mitchell since I was 11 years old, when my older sister fell in love with Blue. Often when Mitchell would try something new, I wouldn't understand it or care for it at first, only to find that in years to come, it became a staple of my collection. But my love for Joni Mitchell - bordering on hero worship, I'll admit - centres on much more than her songwriting or musical talents, prodigious though they are. As I grew into young adulthood listening to and reading about her, Joni Mitchell became a model to me, as a woman and an artist. Her insistence on living her life on her own terms, and on creating what she wanted, without attention to market forces or commercial pressures, inspired me - and guided me. Mitchell never wore a badge pronouncing her different or rebellious or iconoclastic. She just lived her life, and made her music and her paintings, because that's who she was. I would never compare whatever meagre skills I possess to Mitchell's gifts, but then, what good is a role model who's just a regular person? I've always identified Joni Mitchell as Canadian (along with Neil Young and, to a lesser extent, Leonard Cohen). But since moving to Canada, I've been surprised by the absence of Mitchell in Canadian culture. In the car, I listen to Jazz FM. They play a very wide variety of jazz - jazz broadly defined, as it should be - and they favour Canadian artists. But, to my knowledge, they play no Joni Mitchell. (I've been meaning to ask them about that, and I will.) I see Leonard Cohen's name in the news fairly regularly, along with the usual pop suspects, but rarely a word about Mitchell. I don't know why. When Mitchell is in the media, she's usually diminished in stature. Today's Toronto Star referred to her as "folk icon". Folk! Mitchell hasn't been a folk singer in more than three decades. Well, at least they put her on the front page. Here's an interesting essay from the CBC website about the influence of Mitchell's Blue on some artists and listeners. It's a nice piece by a woman much younger than me, who sees Mitchell from a similar vantage point. I never miss an opportunity to see Joni, either live or on TV. Unfortunately, I was so busy trying to get this blog straightened out that I forgot to set the VCR for the induction ceremony. If you know if it's being rebroadcast, or if for some reason you taped or TIVO'd it, please let me know. "what does that say about our shameful silence?" Ottawa's decision to compensate Canadian Maher Arar for its role in his unlawful imprisonment and torture contains a warning and a lesson. The warning is that Canada and the U.S. are on fundamentally different paths when it comes to matters of terrorism and human rights. The lesson is that until Ottawa gets more aggressive with our friends in the war on terror, a Canadian passport won't mean much. First the warning. The U.S. has chosen to subordinate the principles of individual freedom to what it sees as its security needs. It jails people indefinitely without charge, utilizes interrogation methods that the United Nations describes as torture, wages illegal wars and commits the very crimes against humanity it once helped to prosecute. For America's friends, this is heartbreaking to watch. At first, the Canadian government tried to skate by this new troubling reality. It refused to give unqualified support to the U.S. war on Iraq, but participated eagerly in its invasion of Afghanistan. It passed draconian anti-terror laws but was loath to use them, preferring to hand over Canadian suspects (St. Catharines resident Mohamed Mansour Jabarah being the most notable example) to U.S. authorities to do with as they saw fit. It didn't raise a peep when the U.S. imprisoned Canadian teenager Omar Khadr in its notorious Guantanamo Bay prison camp. Finally, as Justice Dennis O'Connor's judicial inquiry concluded, while Canadian authorities didn't have any reason to arrest computer engineer Arar, they happily gave the U.S. information (much of it wrong) that helped convince the Americans to do just that. The U.S. then promptly sent him to Syria to be tortured. If it had not been for the chain of events that this unleashed, Canada might still be happily muddling along its inconsistent path. But the Arar case made the contradictions of post-9/11 Canada-U.S. relations so clear that even Americanophile Stephen Harper has to acknowledge them. "It has raised concerns," the Prime Minister said yesterday when asked at a news conference if, in light of the Arar matter, his government will be able to trust Washington. That puts it mildly. Thanks to Arar, the two governments are fundamentally at loggerheads over how to handle security issues. The U.S. administration insists it was right to send Arar to Syria to be tortured. Ottawa, on the other hand, has concluded that what Canada and the U.S. did to Arar was unjustified – to such an extent that it's willing to compensate him at a cost of more than $10.5 million. But if we are so far apart on this case, what does this say about Canada-U.S. co-operation in other areas of the so-called war on terror? What does that say, for instance, about our role in the U.S.-inspired counter-insurgency efforts in Afghanistan? What does that say about our shameful silence on the matter of Khadr, who faces a Guantanamo tribunal so flawed that even American military lawyers have condemned it? The lesson is that in the post- 9/11 world Canada must better protect its own citizens – not from our enemies but from our friends. O'Connor detailed the failings on the part of the Canadian government when it came to Arar, and in particular Ottawa's reluctance to make a concerted effort on behalf of someone tarred with the terror brush. Yet, it seems this lesson has not yet been learned. Canada is doing its usual tiptoeing over the fate of Chinese-born Canadian citizen Huseyin Celil, who was imprisoned while visiting in-laws in Uzbekistan last spring, deported to China and jailed. China's excuse is that Celil is a terrorist. When Harper, to his credit, attempted to take a more aggressive line with Beijing, he was roundly pilloried by Canadian business interests for threatening their opportunities in China. So, he quieted down. More recently, Ottawa has maintained the same kind of no-muss, no-fuss approach in the case of Bashir Makhtal, a Canadian citizen living and working in Somalia. When the latest civil unrest erupted there last month, Makhtal took the Canadian government's advice and fled Somalia, only to be arrested by Kenyan authorities when he tried to enter that country. He was jailed and deported – not to Canada, where he is a citizen, but to Somalia where he is not (Makhtal was born in Ethiopia). Indeed, his family fears that Makhtal, whose grandfather was once a secessionist rebel in Ethiopia, has been passed on to that country – where he is unlikely to receive tender treatment. Our friends the Kenyans apparently think Makhtal was somehow connected to the deposed Islamic government in Somalia, which according to the U.S. government makes him terror-linked. The point is that, like Arar, Bashir Makhtal, Huseyin Celil and Omar Khadr are Canadian citizens. If that label means anything, it means Ottawa should do for them what it did not do for Maher Arar. It should move heaven and earth to bring them home. Allan changed into warm clothes, and we went straight to breakfast. After a lot of good food, we bundled up again. This week, every time I stepped outside, I remembered how much I love the cold, and love winter. I have no tolerance for heat and humidity. In the summer, I'm ready to collapse five minutes after walking outside. But winter! As long as I'm dressed for it, I love the bracing cold air, and how alive it makes me feel. We were just as excited about our plans for that morning as we were about the Ice Hotel: dog sledding! We had booked the longest trip that was available through the Auberge, 90 minutes. There was only one other couple on our trip, plus a guide with a team at the front, and one at the back - four teams total. Once the sleds come out, all the dogs in the kennel go crazy, barking and jumping, hoping it's their turn to go. The sleds have to be anchored in, or the dogs would take off and never be seen again. While they're being harnessed and readied, the dogs are just going insane with happy anticipation. (Stacie, am I getting this right?) Finally the first team takes off, and soon we're flying down the trail. The trail wound through an arboretum. Snow was shaking off the pine trees, and there was no other sound but the dogs panting and the occasional shouts to get them stopped or started. We were told if they stopped to sniff or pee, when they were finished, to shout, "Allez allez! Allez du chiens!" We switched driving and sitting twice, so we each drove twice, and were a passenger twice. It was fabulous; I never wanted it to end. After the ride, we spent a little time with the dogs, had hot chocolate and cookies in a yurt, and held one-month old Husky puppies. We were melting. Since then, I had pretty much given up on the idea. I started to think we'd never do it. After dog-sledding, we had lunch at the Auberge, then went down to the cross-country ski lodge. Our package included a multi-activity pass, where we could do anything the resort offers, all paid for, including equipment rental. I had always wanted to try cross-country skiing, but never had the opportunity. This was my chance. In case you imagine me to be someone I'm not: I have zero athletic ability. As a child, I had a history of painful and embarrassing episodes, always falling and hurting myself while doing next to nothing, and as I got older I learned to avoid anything that required balance or coordination of any type. Allan has seen me try to climb a fence. It's a pathetic and dangerous thing. I love to hike and to be outdoors, but I'm not competitive, and it was a great relief when I aged out of being the last one standing when choosing sides for teams. Hey, I'm not whining about it, and I'm not complaining. It's just the facts. For some reason, cross-country skiing always stuck in my head as something I might be able to do. But living in New York City and not being big outdoors types - and never taking a winter vacation - we never went out of our way to try it. So I thought this trip would be a great opportunity - it's paid for, it's at the lodge, and if I can't do it, I'll just stop, nothing lost. So, I tried it. And I did ok! I managed to ski on an easy trail, had a very hard time turning around - fell, had a hell of a time getting up - and skied back. Most amazingly to me, I actually did better than Allan. He fell several times, and didn't enjoy himself much at all. I completely sympathize, since I've been there more times than I care to remember. I mean absolutely no disrespect to my esteemed partner when I say: this was the first time in my life I was actually not the worst one at something, that I actually did all right at an activity the first time I tried it. Go figure. After we managed to get back to the ski lodge, that was quite enough activity! Dry clothes and a drink at the bar were in order. We had another wonderful dinner at the Auberge, and fell asleep almost immediately after. The next day, yesterday, we left early. We drove back through frozen Quebec, through snow-covered Ontario farmland, back into the sprawl, and home to our Cody. She and Ellen The Amazing Dogsitter had a fantastic time without us. How much do I love to travel? I even love a nine-hour drive, talking with my sweetie and listening to music, watching the world outside the window. A fantastic four days. Come in to see a bit of our trip! We had a relaxing drive through eastern Ontario, then north to Quebec. We haven't seen much of Ontario before. The farmland looks beautiful in winter. It looks just like my native New York State, which makes sense, since it's pretty much the same land mass. Because we work late on Sunday nights, we couldn't get a very early start on Monday, so we decided not to make the whole drive in one day. We made it past Montreal, then stopped north of the city in a town called Berthiersville, because we saw a sign for a motel right off the highway. We had a comfy night and an early start the next day. We've been in Montreal many times, but we've never driven elsewhere in the province of Quebec. Looking at the map, we were amazed at how much of Quebec is national park or wilderness area. (We will definitely make a trip to see the Old City of Quebec, as well as to Ottawa.) We passed frozen streams, rivers and lakes, and saw a long line of ice fishing shanties stretched out on one lake. The last part of the drive was through a tiny town called Ste.-Catherine-de-Jacques-Cartier, near Quebec City. It was deep winter there, and very quiet. 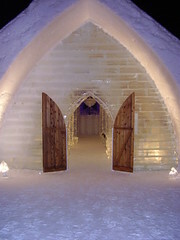 The Ice Hotel is built on the grounds of the Auberge Duchesnay, on Lac St.-Joseph. There are villas right on the lake where several families can stay together, smaller lodges, cabins for hikers and skiers, as well as the main inn, where all the rooms overlook the lake. I would describe it as rustic elegance - a natural look that fits with the surroundings, very warm and inviting. Very beautiful. We got settled in our room, put on a few more layers, and went down the hill to see the Ice Hotel. Workers were still building some sections and putting finishing touches on others. We never found out if they were behind schedule because of the warm weather earlier this winter, or if the hotel is always a work in progress for the first few weeks. It was very interesting to see the work going on, though. The hotel wasn't actually open to visitors that early, so we just wandered around ourselves. We took a peek in the room that had to be ours - since it was the only one with a back door leading to a private hot tub and sauna. There was a fair amount of administrative business to take care of: we had to check in at both the Auberge and the Ice Hotel, sign up for the orientation for overnight guests, get passes, vouchers, a locker, all kinds of things. We were really glad we decided to drive up the day before. Arriving after a 9-hour drive would have greatly detracted from the enjoyment. Once the business was taken care of, we had lunch at the lodge, overlooking the frozen, snow-covered lake. (Everywhere you go there, you're overlooking the lake.) Then we went back to the Ice Hotel to look around more. The theme this year was Atlantis, the mythical underworld city. There were sculptures of Neptune or Poseidon, an huge octopus holding up the bar at the N'Ice Club, and fish, snails, mermaids and all kinds of marine life carved into the columns. Although everything is carved out of the same material - ice - the sculptors use a huge variety of textures. The columns are made of shiny ice blocks; some walls look like rough, snowy bricks; some of the work is very fine and detailed; some looks like it's been carved out of snow, even though it's solid. Built into the sculptures is special lighting that emits no heat. The sculptures are lovely during the day, but at night, the coloured lights bring out more detail, and they are spectacular. We didn't want to bother with our better (conventional) camera and lenses, and you would probably need professional lighting to really capture the detail, since so much of it is monochrome. But we did what we could with our little digital camera. In the late afternoon we took the orientation. The guide showed the arctic sleeping bag that would be delivered to your room, and explained how to keep warm at night. There's an inner nylon bag that you get into first, then the arctic sleeping bag, which is rated for -40 C.
We were also quietly enjoying the fact that we had the most luxurious suite in the Hotel, as well as our beautiful back-up room in the Auberge. This was a very special splurge for us, and we felt we deserved to bask in it a bit. The orientation was held in a small lodge reserved for overnight guests. It would be open all night, with a fire going, coffee and hot chocolate available, and heated bathrooms. Overnight guests could come in any time for a break from the cold, or if they started to freak out in their sleeping bag. (Apparently this is not unusual. )This is also where you pick up robes and towels for the hot tub, and there are lockers for people without a back-up room. After the orientation, we had dinner at the Auberge, which was really lovely. It's so cool that we can drive to the province next-door, and it's like being in another country. When I lived in New York, I always said that visiting Montreal was like going to Europe for the weekend. This felt the same way. It's not only the language, although that's part of it. It's the ambiance. It has that French, European feel. I love it. It's beautiful that this, too, is Canada. After dinner, we bundled up and headed to the N'Ice Bar. The larger N'Ice Club wasn't open - you could go in and walk all around, see all the sculpture, but there was no bartender and it wasn't set up for guests. So we hung out at the N'Ice Bar, drinking out of glasses made of ice and chatting with other overnight guests. In case you're wondering, we were wearing: three pairs of socks (one of them made of llama wool), boots; base layer pants, thermal underwear and cotton pants or jeans; a short-sleeved t-shirt, a long-sleeved t-shirt, our Aran knit sweaters from Ireland; parkas; glove liners, gloves, and a hat. Normally I hardly ever wear my Aran sweater - it's seldom cold enough. And I've never worn it under a parka! Dressed like that, we were nice and toasty the whole evening at the bar. When we were ready to quit the bar for our hot tub, it required quite a bit of preparation. We picked up robes and towels from the guest lodge, and got our dry socks and sleeping layer from our locker - but still. It was confusing, and a bit of a production. Even with a small heated changing room, how do you approach a hot tub in the snow? How do you dry off completely between hot tub and bed - when it's -25 outside? There's simply no way to completely avoid it: at some point you're going to be naked, outdoors, in the snow. Whoa baby. That was a first for me! Our boots were next to the tub, but it was snowing, so while we were relaxing in the hot bubbles, our boots were filling up with snow! You could either put your feet straight from the hot tub into snowy boots (which Allan did), or run barefoot through the snow to the changing room (which I did). At one point I ran from the changing room to the ice room in my robe, screaming, "Socks, I need socks! I'm barefoot in the snow!" I must admit that the hot tub was more fabulous in theory than in practice. But it was all pretty hilarious. Then came the big production of getting ready for bed: getting completely dry, changing into a dry base layer, unrolling the sleeping bags (which you only do right before bed), stashing your parka in the bag the sleeping bag was in, putting your layers for the next day in the bottom of your sleeping bag... on and on. I never succeeded in getting the sleeping bag tight around my neck, and I couldn't locate a scarf in the cold and dark, so cold air was drifting in my sleeping bag through the neck hole. My feet were cold, too - not painfully so, but enough to be uncomfortable. I guess I slept off and on, although it felt more off than on. I was disappointed by this - yet everyone I saw the next day asked, Did you sleep at all? Did you make it through the night? How long did you make it for? and such. So apparently it's not at all uncommon to give up and come back to the lodge for the rest of the night. In the morning, I was tired of lying in the cold, tired of lying in the same position. Fishing around in the bottom of my sleeping bag, I found my cell phone, still on: it was 6:00 a.m. At 7:30, staff would be coming in to wake us with mugs of hot chocolate. I thought, what the hell, I've made it to morning. No point lying here for another hour and a half. I found my robe, wrapped myself up, stuck my feet in my freezing cold boots, and dragged everything else into the outdoor changing room - where the heater had been on all night. I threw clothes on, threw my parka on, didn't even bother to tie my boots, kissed Allan goodbye, and trudged out. I trudged through the Ice Hotel, passing a staff member on duty - "Going back to my warm room" - and trudged outside. There were six inches of freshly fallen snow on the ground. It was completely silent. It was so beautiful. I trudged up to the hotel, into my wonderfully warm room, stripped, and took the world's hottest shower. It was positively brilliant. Allan showed up about 7:45, holding my mug of coffee. He had been sound asleep when they came to wake him. 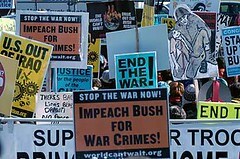 Tomorrow is the big March on Washington to demand an end to the war on Iraq. If you can go, please do. You'll be glad you did. If you can't attend, find out what you can do to support the peace movement. We're back! I have three quick things to say, and I'll blog more either tomorrow, if work permits, or Saturday if it does not. 1. It was fabulous. I love winter, I love Quebec, we loved the Ice Hotel and the whole experience. 2. We've learned that Rogers will have the rights to the MLB Extra Innings package. We are beside ourselves with joy. I noticed there are many comments in that thread, including several from Scott M, so I'm guessing you all knew this before we did. (Allan came home to an email from another Canadian Sox fan.) I'll read and reply to comments tomorrow. We'll also continue to fight the fight for everyone else affected by this craziness. 3. In the car on the way to Quebec, I realized the main reason that WordPress software won't work for me: in that scenario, I could only blog from my own computer. No good. I blog from work at least three times a week, and I need the ability to blog while travelling. Being able to blog only from home is an absolute deal-breaker for me. Now I must go. More soon. We're off to Quebec and the Ice Hotel! Back on Thursday. Love to all. I am pro-choice because I am a human being. I am pro-choice because I deserve control over my body. I am pro-choice because without reproductive freedom, women are slaves. I am pro-choice because I know the difference between a baby and a blob of cells. I am pro-choice because no government has the right of absolute control. The government's rights stop where my body begins. I love this video! Many thanks to James for sending it to me. Watch and enjoy. Tell the world why you're pro-choice. When this blog was first getting off the ground, and especially after the 2004 "election," it was beseiged by angry wingnuts. One of the things they seemed to enjoy was displaying their utter ignorance of Canada. I don't mean the usual ignorance of geography or weather. Memorable lines included "Enjoy being taxed to death! ", "If you live in Montreal, don't expect your children to learn English," and "I hope you're never sick, because you'll die waiting to see a doctor." Hey, it's all back there in the archives somewhere. As the man said, you could look it up. One Mensa candidate claimed that we best not say anything bad about the Queen: "they" would knock on our door in the middle of the night and drag us away. I thought of that when I read this story, sent to me by you-know-who. An elderly man who wrote in a letter to the editor about Saddam Hussein's execution that "they hanged the wrong man" got a visit from Secret Service agents concerned he was threatening President Bush. Two Secret Service agents questioned Tilli at his Bethlehem apartment Thursday, briefly searching the place and taking pictures of him, he said. The Secret Service confirmed the encounter. Bob Slama, special agent in charge of the Secret Service's Philadelphia office, said it was the agency's duty to investigate. "We have no further interest in Dan," he said. Tilli said the agents appeared more relaxed when he dug out a scrapbook containing more than 200 letters that he has written over the years, almost all on political topics. "He said, 'Keep writing, but just don't make no threats,'" Tilli said of one of the agents. It wasn't Tilli's first run-in with the federal government over his letter writing. Two FBI agents from Allentown showed up at his home last year about a letter he wrote advocating a civil war to unseat Bush, he said. I was in college (university) when Ronald Reagan was shot. A student, idly musing something like, "Too bad he didn't finish the job," was visited by the FBI. As I recall, no one even knew how they learned of his comment. I feel like I've been put through the wringer trying to figure out what to do about this blog. Now there's yet another variable in the mix, and it kind of forces my hand. 1. I got my own URL, and decided to redesign the site. 2. I thought I should first upgrade to Blogger Beta before redesigning, so I waited (and waited) for Beta to accommodate non-blogspot addresses. 3. Blogger's upgrade finally accommodated non-blogspot addresses, and at the same time came out of Beta. 4. I upgraded, and learned that non-blogspot addresses don't get any of the cool new features of the upgrade! In addition, I can't update on the fly. I'm still watching the dreaded spinner of death. 5. After some investigation, I decide to bring my blog to WordPress. All the neat features that are new to Blogger have been standard on WordPress all along, plus many others that really fun. Through domain mapping, I can use my own URL. In addition, they have actual support - real people to whom you can address questions and get answers. (Amazing!) All seems well. I open a WordPress account. 6. I then learn that WordPress's importer tool - through which I can bring the entire wmtc blog, including comments, over to WordPress - does not work with the New Blogger. They will upgrade the importer tool "soon". I wait. 7. At the same time, the person who is redesigning the blog is having a lot of trouble, both in his own overextended schedule, and in working with WordPress. 8. I continue to wait on both. That's where I was as of yesterday morning. Then, the new wrinkle. 9. I have just learned that Automattic, the company that owns WordPress, runs Google Adsense ads on some blogs - without the blogger's knowledge or consent. This totally threw me. I can't have ads running on my blog. It's out of the question. And if I did want ads on my blog - which I don't - I'd at least make some money off of them. The revenue from these ads goes to Automattic. There's no way to opt-out or shut them off. So it looks like all this time I have been waiting for WordPress to fine-tune their importer tool, and all the time the web designer struggled to work with WordPress's platform, we were just spinning our wheels. I learned about the ads by accident, through a chance comment on a WordPress forum. (A WordPress blogger saw wmtc's ad-free blog owl and said, "You know WordPress runs ads on our blogs without our consent, right?") As disappointed as I was, I am also greatly relieved to have discovered this before I imported my blog there. Option 1: Stay with WordPress and put a disclaimer on the blog that any ads here run without my consent and approval, and I earn no revenue from them. Drawbacks: The ads are still there on the blog. I'm participating in something I strongly disapprove of. Option 2: Download and install free software from WordPress.org (as opposed to WordPress.com), and host the blog myself. Option 3: Go with another blog platform. A WordPress support person gave me a link that lists several. Drawbacks: I don't know how good or reliable any of these sites are, what kind of features they offer, how their support is, and so on. I don't have the time, patience or inclination to research them. Option 4: Stay with Blogger. Here's where it gets interesting. Blogger just announced that they are now hosting custom domain names. This means, theoretically, that I could now use all the new Blogger features and keep my own domain name. Drawbacks: I guess the drawback would be leaving the friendly, responsive, pleasure-to-deal Laughing Squid, and being hosted by the large, anonymous, impossible-to-get-real-support Google/Blogger. Also, will Blogger's custom domain hosting be reliable? I'm tired of this whole mess - tired of waiting, tired of all the time I've wasted, and sick to death of my blog design. I want it to be solved already. Major League Baseball is close to announcing a deal that will place its Extra Innings package of out-of-market games exclusively on DirecTV, which will also become the only carrier of a long-planned 24-hour baseball channel. Extra Innings has been available to 75 million cable households and the two satellite services, DirecTV and the Dish Network. But the new agreement will take it off cable and Dish because DirecTV has agreed to pay $700 million over seven years, according to three executives briefed on the details of the contract but not authorized to speak about them publicly. InDemand, which has distributed Extra Innings to the cable television industry since 2002, made an estimated $70 million bid to renew its rights, more than triple what it has been paying. Part of its offer included the right to carry the new baseball channel, but not exclusively. Extra Innings lets subscribers, for a fee, watch about 60 games a week from other local markets except their own. The only other way that fans without DirecTV will be able to see Extra Innings will be on MLB.com's mlb.tv service, but they must have high-speed broadband service. About 28 million homes have high-speed service, less than half the number of cable homes in the country. The picture quality of streamed games is not as good as what is available on cable or satellite. I well understand that Major League Baseball is a business and exists to make money. I don't need to be reminded of that and I don't have a problem with it. But a move like this demonstrates MLB's utter contempt for their fans. Instead of negotiating contracts that bring baseball to the greatest number of people possible, they assign exclusive rights, putting the interests of a television provider ahead of the interests of millions of fans. We don't want to watch baseball on our friggin computers! We want to watch it on TV. That's why we pay for digital cable! I'm stunned over this - and furious. I'm also hoping against hope that this boneheaded decision can be reversed. It wouldn't be the first time that fan outrage changed an MLB decision; remember the Spiderman bases? Most wmtc readers are not effected by this, but if you are, please don't just complain to yourselves and your blog. Go to the source. P.S. PLEASE don't suggest - even in jest - that I solve this problem by becoming a Blue Jays fan. Thank you in advance for your cooperation. whose law is it, anyway? The Star's Thomas Walkom grinds the Deep Integration gears. He's right. This really pisses me off. Here's what I don't understand. I don't understand why companies that operate in Canada are allowed to flout Canadian laws. I don't get why, when Canadian laws interfere with U.S. ones, the latter take precedence. Here. In Canada. I understand why the federal government lets this happen. It doesn't like to rock the boat when it comes to dealing with Washington. But I really don't understand why more Canadians aren't outraged that their own government is so cavalier about the centrepiece of any country's claim to independence – its right to legislate in its own territory. The problem is ongoing. The latest example came to light just this week after the Royal Bank refused to let a Canadian citizen open a U.S.-dollar bank account in one of its Montreal branches – because he was born in Iran. Payam Eslami, 27, moved to Canada when he was 8. The bank's explanation was that if it wants to do business in the U.S., it must strictly follow American law. American laws discriminate against people from certain countries that Washington doesn't like, including Iran and Cuba. All of which would have been fine if Eslami had been attempting to open a bank account in, say, Syracuse. But at last count, Montreal was still part of Canada. And in Canada it is illegal and unconstitutional to discriminate against individuals on the base of nationality. Not that the Canadian government seems to care. "This is a jurisdictional issue, and the jurisdictions are clear," Public Safety Minister Stockwell Day said. "These are accounts in U.S. currency, and the law applies to the country of jurisdiction." By which he meant that U.S. dollar holders around the world have to adhere to American rules, while Canadian currency holders – even in the U.S.– have to obey Canadian ones. Now, first of all, this is almost certainly not true. If a Canadian living in New York tried to ship Canadian dollars to a country under U.S. sanctions, he'd be arrested and charged. The fact that Canada imposes no such sanctions would be deemed irrelevant by U.S. authorities. Second, Day's explanation is beside the point. Countries may attempt to apply their laws outside their own borders. But other nations don't have to agree. Imagine the outrage if the Royal Bank had refused to let a Canadian Jew open a bank account just because it wanted to protect its business with Saudi Arabia. In fact, you don't have to imagine. There was such outrage some 30 years ago when countries such as Saudi Arabia attempted to extend the so-called Arab boycott against Israel to countries that wanted to do business in the Middle East. Ontario responded by making it illegal for firms in this province to adhere to the Arab boycott. So did Ottawa. In 1990, the director general of the Ontario Science Centre was fired after it came to light that the government-run attraction had signed a contract with Oman containing a boycott-of-Israel clause. As well, successive Canadian governments have consistently objected to U.S. laws that penalize Canadian firms doing business with Cuba. Ottawa's quite reasonable argument here has been that American laws have no standing in Canada. But that's not the case these days, it seems. The Royal Bank incident is just one of many. Since 9/11, defence firms operating in Canada have routinely prevented Canadian workers who are dual citizens of countries on the U.S. blacklist from working on certain military projects. A case involving Bell Helicopter's Montreal plant came to light last week after the company shifted 24 workers who are dual citizens away from a U.S. military project. In October, another defence firm, CAE Inc., refused to allow workers born in countries on the U.S. blacklist from applying for certain jobs. In 2002, General Motors of Canada laid off 172 dual citizens in its London defence plant. All of these actions were designed to bring the firms in line with discriminatory U.S. defence procurement rules. All are almost certainly illegal under Canadian law. Indeed, the Ontario Human Rights Commission is bringing both GM and the London plant's current owner, General Dynamics, before a human rights tribunal over this issue. Meanwhile, the Royal Bank has tried to defuse the situation by agreeing to let Eslami open his U.S- dollar account – as long as he promises not to make too many trips to Iran. Which may solve his particular problem, but leaves the general point – the question of whose laws taken precedence in this country – very much unresolved. Last week, the US military court that will try Lt. Ehren Watada ruled that no arguments about the illegality of the war on Iraq will be admitted at the court martial. Nearly two weeks after hearing arguments in the January 4 pre-trial phase of Lt. Ehren Watada's court martial for refusing to deploy to Iraq, and explaining his refusal to the press, military circuit judge Lt. Col. John M. Head today issued brief, tersely worded rulings January 16, 2007. In summation, "The defense motion for a hearing on the "“Nuremburg defense" is DENIED. The government motion to prevent the defense from presenting evidence on the legality of the war is GRANTED." The defense motion to dismiss the four political speech charges was also "DENIED." In response, a group of activists have organized a citizen's war tribunal. The Citizens' Hearing will function as a tribunal to put the Iraq War on trial, in response to the Army putting Lt. Watada on trial as the first U.S. military officer to refuse deployment to Iraq. Please help bring out the truth about the Iraq War by donating today. By helping the Citizens' Hearing document the legal case against the war, you will help present the case for Lt. Ehren Watada--and for those who may follow his example. By highlighting the illegality of U.S. actions in Iraq, the tribunal can inform military personnel and other citizens to reflect deeply on their roles and responsibilities in an illegal war. We intend for the Citizens' Hearing to heighten the discussion of the Iraq invasion and occupation in the public--and within the military itself--as similar tribunals did during the Vietnam War. We are inviting testimony by Iraq War witnesses and experts. Your donation will be used to bring the testifiers and panelists to Tacoma and to record the event so everyone can benefit from the testimony. The hearing will present the case that Lt. Watada would, if allowed, make at his court martial. His defense attorneys maintain that the war on Iraq is illegal under international treaties and under Article Six of the U.S. Constitution. Further, Lt. Watada's defense argues that the Nuremberg Principles and U.S. military regulations require soldiers to follow only "lawful orders." In Lt. Watada's view, deployment to Iraq would have made him party to the crimes that permeate the structure and conduct of military operations there. *Stacy Bannerman Military Families Speak Out; author of "When the War Came Home"
*Eman Khammas, Iraqi human rights advocate (via video). *Geoffrey Millard, 8 years in NY Army National Guard; stationed in Ground Zero, Kuwait, Iraq. *Dennis Kyne, 15 years as Army medic & drill sergeant; trained in NBC warfare; Gulf War I. *Chanan Suarez-Diaz, Former Navy hospital corpsman; awarded Purple Heart & Commendation with Valor. A panel of citizens will hear the testimony, examine witnesses, and issue a fact-finding report. The panel will be comprised of veterans, members of military families, high school students, union members, and representatives of local governments, academia, and religious organizations. Panelists' questioning will focus on the legality of the war and whether or not the invasion of Iraq in 2003 constituted a "crime against the peace," whether the military occupation and economic constriction of Iraq constitutes a "crime against humanity," and whether individual soldiers have an obligation or duty to refuse unlawful orders. We expect that this hearing will focus attention on the role of the U.S. government--rather than that of individual soldiers--in perpetrating the crimes of the Iraq War. The U.S. occupation of Iraq has lasted longer than our involvement in World War II. Despite the recent election results raising many hopes for a withdrawal from Iraq, few congressional leaders have questioned the war's basic legality--only how it is being fought. We should now remember that President Nixon's "withdrawal" from Vietnam took years and was based on a dramatic escalation of violence. The Citizens' Hearing will focus critical attention on the underlying premises of the Iraq War at a critical time when its future is being decided. You can support this action and other Iraq war resisters by visiting Courage To Resist and donating to individual resister's defence funds. Ehren Watada's court martial begins on February 5th. If you support Watada's cause, learn how you can stand beside him. This is such a bizarre Canadian coincidence that I have to pull it out of comments and give it a post of its own. ImpStrump's idea reminded me of a movie that I saw in 6th grade - and never forgot. When you were in grade school, did you see a movie about a miniature wooden kayak with a little carved in it? A boy puts it in a stream, or maybe in some snow melt on a mountain...? Here's what I remember. Someone carves a little man in a canoe or kayak, and sets it in a stream or maybe some snow melt. The movie follows the toy canoe as it journeys over all kinds of water to the sea. As the viewer, you forget that it's a wooden toy - and when it's in trouble, or turns over, or is stuck somewhere, it's exciting or scary. I remember teachers telling us to remember it's not a real man. This seemed to ring a bell with several readers. I couldn't find anything on Google, but little did I know, I was looking in the wrong place. The place to search? The National Film Board of Canada. This film I saw in the 6th grade and never forgot was Canadian. I was - I am - astounded. I always saying "everyone is Canadian," but this is completely ridiculous! For all children and those adults for whom the romance of journeying is still strong. This great NFB children's classic is adapted from a story by Holling C. Holling. During the long winter night, an Indian boy sets out to carve a man and a canoe. He calls the man "Paddle to the Sea." The boy sets the carving down on a frozen stream to await the coming of spring. The film charts the adventures that befall the canoe on its long odyssey from Lake Superior to the sea. This delightful story is photographed with great patience and an eye for the beauty of living things, offering vivid impressions of Canada's varied landscape and waterways. The boy carves a message into the canoe, for anyone who might find it and pick it up: "I am Paddle-to-the-Sea. Please put me back in the water." I'm also pretty sure that the movie was used as an environmental statement. This was the early 1970s, and air and water pollution were big topics. The canoe starts its journey on pure, clean water, but later finds its way to filthy, polluted lakes and rivers. I don't know if most kids in the US saw this movie. I went to a progressive, semi-experimental elementary school, and I now realize we did a lot of unusual things. Maybe this film was one of them. This is so bizarre, I hesitated to blog about it, thinking it might be a hoax. There appears to be some validity to it - but I still have no idea what to make of it. From an AP Story, via Lawyers, Guns and Money, sent to me by fellow political expatriate Diamond Jim. Top suspects, according to outside experts: China, Russia or even France — all said to actively run espionage operations inside Canada with enough sophistication to produce such technology. The Defense Security Service said it never could substantiate its own published claims about the mysterious coins. It has begun an internal review to determine how the false information was included in a 29-page report about espionage concerns. "The allegations, however, were found later to be unsubstantiated following an investigation into the matter," the agency said in a statement published on its Web site last week. Intelligence and technology experts were flabbergasted over the initial report, which suggested such transmitters could be used to surreptitiously track the movements of people carrying the coins. Experts said such tiny transmitters almost certainly would have limited range to communicate with sensors no more than a few feet away, such as ones hidden inside a doorway. The metal coins also would interfere with any signals emitted, they said. Experts warned that hiding tracking technology inside coins would be fraught with risks because the spy's target might inadvertently give away the coin or spend it buying coffee or a newspaper. Whenever the US retracts something, I am very suspicious. This seems like the complete wrong direction. The U.S. wants Canada to dramatically expand its oil exports from the Alberta oilsands, a move that could have major implications on the environment. U.S.and Canadian oil executives and government officials met for a two-day oil summit in Houston in January 2006 and made plans for a "fivefold expansion" in oilsands production in a relatively "short time span," according to minutes of the meeting obtained by the CBC's French-language network, Radio-Canada. The meeting was organized by Natural Resources Canada and the U.S. Department of Energy. Canada is already the top exporter of oil to the American market, exporting the equivalent of one million barrels a day — the exact amount that the oilsands industry in Alberta currently produces. A fivefold increase would mean the exportation of five million barrels a day, which would supply a quarter of current American consumption and add up to almost half of all U.S. imports. But the current extraction of oil from the tarsands results in the spewing of millions of tonnes of greenhouse gases into the atmosphere: it's already the biggest source of new greenhouse gas emissions in Canada. The news of the call for the massive boost in oil production comes as Prime Minister Stephen Harper has pledged to make the environment one of his top priorities, vowing that Canadians deserve more action on climate change. Polls show the environment is the number one concern of Canadians. Yet, according to the minutes of the Houston meeting, to multiply its output by five and to do it quickly, Canada would have to "streamline" its environmental regulations for new energy projects. Many Canadians won't criticize anything related to the oilsands, since they generate jobs almost as quickly as they do greenhouse gases. But just as we can't allow the logging and paper industries to determine which forests get cut down - or we'd have no trees left - we can't let the oil concerns to set our environmental priorities. Maybe the fact that this call is coming from Bush's US will help turn Canadians against the idea. you don't look cool. you look like an idiot. I'm rethinking my absolute opposition to the death penalty. I'm pretty sure that anyone walking around with one of these should be shot. Preferably on sight. Allan's plan to foil Zip's bad service worked. I deleted all but the top five movies in our ZipList (keeping a list of the titles, of course), and they finally sent my #1: "An Inconvenient Truth". I just got the email saying it's been shipped. Yes, believe it or not, I haven't seen "An Inconvenient Truth" yet, because I was waiting for the DVD, then waiting for Zip. Unfortunately, we'll be working when it comes, then we're away next week. But it will be here waiting for us. This doesn't solve the problem with Zip, but at least we'll get the movies we want before baseball season starts. Did you know that unpiloted surveillance aircraft will soon be patrolling the Canadian-US border? Now doesn't that make you feel safer? The United States government is poised to begin flying unmanned surveillance aircraft along the Canadian border, using Grand Forks as the takeoff point for the robot-controlled flights. Before September, U.S. Customs and Border Protection, an arm of the federal Department of Homeland Security, will start sending propeller-driven drones called Predators into American airspace. At first one drone, with more to follow, will span much of the 8,900-kilometre frontier Canada and the U.S. share between the Atlantic and Pacific oceans. Never before has the U.S. kept such a close watch over its northern boundary. The move is a response to growing American fears that the entry of even one potential terrorist through Canada could have serious consequences, said Scott Baker. He took over last Friday as Chief Patrol Agent of Customs and Border Protection in Grand Forks, N.D., responsible for guarding the 1,400-kilometre stretch of border between Lake Superior and Montana. "Just one of the wrong people getting through, driving through our border area, could spell catastrophe," Baker said. "So, it is a concern." The fear terrorists will exploit that remoteness to penetrate the U.S. concerns American politicians, said Doug Marshall, director of Project Development at the University of North Dakota's Odegard School of Aerospace Sciences. It also makes monitoring the border by drone more efficient than any effort involving humans. "We don't have hordes of Canadians sneaking across the border to come shopping in Grand Forks," Marshall said. Here's a bit from the above story: "Predators, known by the military as unmanned aerial vehicles, or UAVs, have flown missions along the U.S.-Mexico border for several years." Why, that must be why we never hear about illegal immigrants crossing the US-Mexico border anymore! Another problem solved, thanks to military technology. Hurrah! This story from the Winnipeg Free Press has a sidebar about the drone aircraft. A similar remote-piloted aircraft ("the MQ-1 Predator is a system, not just an aircraft") cost $40 million back in 1997. 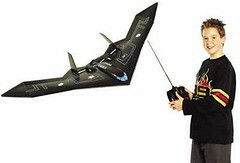 What a coup for the folks who make these toys, and the kids who get to fly them. TWOT has been very successful for some people. Thanks to James for reminding me about this. "getting rich by being wrong"
Want to learn something about the state of the US media brain trust? This is some seriously eye-opening stuff. Read about war profiteers Thomas Friedman, Peter Beinart, Fareed Zakaria and Jeffrey Goldberg: punditry gone awry. Pre-war position: Re-reading Friedman's columns from the six months or so prior to the invasion of Iraq can induce vertigo. Unlike many of his hawkish colleagues, he grokked all the vital details of the situation. He understood that there were alternatives to war ("Bottom line: Iraq is a war of choice"). He understood that the WMD casus belli was for the most part a convenient line (cautioning that it was merely the "stated reason" for the war, and early on calling out Bush and Blair for "hyping" the evidence). He took a shine to the idea of regime change, but seemed clear-sighted about its low chances for success ("Setting up the first progressive Arab state ... would be a huge undertaking, though, and maybe impossible, given Iraq's fractious history"). He grasped that the consequences of failure would be dizzying ("if done wrong, the world will never be the same") and that to succeed, at the very least, would require exceedingly deft execution on the diplomatic front as well as the military one. Yet he also noted that the Bush Administration was incompetent in at least the former respect, and recognized them as essentially a bunch of pathologically insensitive and hyperaggressive bumblers ("we are talking about nation-building ... [and] the Bushies seem much more adept at breaking things than building things"). So even a Webelo-grade logician knows where to go from here, right? You connect the dots and conclude that while it would be very nice to get rid of Saddam, it would also be stupid and dangerous. But somehow he still managed to come out in favor of the war. And if the whole thing weren't so tragically misguided, his reasoning would be worth a chuckle. Says Friedman: "something in Mr. Bush's audacious shake of the dice appeals to me." A nice ballsy gamble of a war. Sure, it could throw the region into chaos, bankrupt this country, and dye the fertile crescent red with the blood of civilians; yet an audacious war is like a red lollipop—who isn't powerless to resist it? Career status: On top of the world. Before the war he was charging less than $40,000 to give a speech; these days it's a rumored $65,000. And afterward the audiences are encouraged to scoop up copies of the World is Flat, his paean to corporate globalism that has been on the Times best-seller list for 91 weeks. The royalties certainly help defray the costs of a $9.3 million mansion in Bethesda and a second home in Aspen that—if the local phone book and Google Earth are to be trusted—is a massive chateau with its own lake on the swanky northern side of town, where Prince Bandar has his monstrosity. Friedman was feted by Queen Elizabeth in 2004, and also received a lifetime award from the Overseas Press Club. Though he was probably the most influential pro-war voice in the American media, he still hasn't had to own up to his mistake. If you ask him about it—as Don Imus did recently—he quotes a few misgivings from his columns to demonstrate that he was quite aware the war could be a fiasco and a bloodbath. But let no one say it wasn't audacious. Read the whole thing here. Then tell me, as some commenters have done, that the media has nothing to do with it. No, don't tell me. If that's what you think, you're too stupid to talk to. Meanwhile, did you know that on the day the Resident announced the escalation of the war, there were more than 1,000 separate demonstrations against it in the US? There were actions in all 50 states and in the poor non-state, DC. What's that you say? You didn't know that? Because it wasn't reported on your TV or in your local newspaper? On the CBC website, there's a good overview feature about depression. One statistic that I question is that women are twice as likely to suffer from depression as men. Perhaps. But perhaps men are under-diagnosed, because it is less socially acceptable for men to seek help for depression. Also, depression often manifests itself differently in men than in women. Where women are more likely to feel sadness and grief, depression in men is often characterized by anger and irritability. Those symptoms may be less recognized as depression, and thought of more as personality traits. I detest the characterization of anti-depressant medications as "happy pills" that are over-prescribed to anyone who feels a little down. For any over-prescribing that's out there (and what drug doesn't have some of that? ), there are so many more people whose lives could be greatly improved by anti-depressants, but who feel they must "tough it out". I've seen such positive, life-changing benefits in so many people I love and care about. I wish more people could experience those. Mississauga is such a nice place to live, in so many ways. Visually and esthetically, it's not much to look at. And I wouldn't want to try to live out here without a car. But if you want to live in the suburbs, Mississauga has so much to recommend it. It's affordable, thanks to Mayor Hazel McCallion's plan of attracting corporate headquarters and keeping taxes low. I'm told that in the eastern suburbs, such as Ajax and Whitby, homeowners pay three times the taxes as Mississauga homeowners do for comparable properties. Mississauga is debt-free - and always has been. Mississauga is extremely diverse, even for the already diverse GTA. According to Wikipedia, more than 45% of the population speaks a language other than English; more than 46% were not born in Canada. Take a stroll down our beautiful section of Waterfront Trail or shop in any mall, and you'll see large numbers of Chinese and South Asian people, and hear Polish, Portuguese, Italian, and other European languages. There are tons of great parks. There's an excellent library system. There are community centres with programs for kids, teens, families and seniors. Although I don't have firsthand experience with the schools, I hear they are excellent. Unlike most people of my political persuasion, I love big-box stores. I always have. I want them to subscribe to fair labour and environmental practices (Costco vs. Wal-Mart), but that's where my issues end. In fact, when a giant like Home Depot resolves to only buy wood obtained through sustainable foresting practices, it makes a huge impact - much larger than any small hardware store could. As a consumer, I love the selection and the convenience. I sympathize with small business owners, but I don't mourn for them any more than I mourn for gas lamps or steam-engine railroads. For half my life I shopped at neighbourhood stores that I could walk to, where I knew the owner, and I don't think they are in any way preferable to the large chains. So having gotten that out of the way, if you want to shop in small, independently-owned stores, Mississauga is a desert. But if you like malls and big-box store shopping, it's paradise. There's an area called "Heartland" - that just cracks me up - that is the largest collection of big-box stores I have ever seen in one place. (What make me think Linens 'N Things didn't compare to the US's Bed Bath & Beyond? I went to the wrong one!) All the big shopping centres are called "town centres," which we find hilarious. One thing about Mississauga, there's no town, and there ain't no centre! This Saturday morning I went to the Y to swim. I normally go during the week, in the middle of the day, but I'm now adding Saturdays, and this was my first time. I went early, thinking I'd avoid kids. The parking lot was packed - luckily the pool was not - and the gym was crowded with young adults and seniors. As I was leaving, around 9:30, dozens of families with kids were streaming in. Families and children of every culture and hue were coming to the Y to swim, play basketball, take classes, work out. It made me feel really good. Especially because I was leaving as they were coming in! But seriously, it was cool. There's little doubt Mississauga is short on cultural attractions. I haven't dared the theatre or the symphony; I fear I'm still too much of a New York snob for that. But we've found several good restaurants - and Toronto is only a half-hour away. After 27 years of a very urban lifestyle (4 years in Philadelphia, 23 years in New York), I was very ready for a change to suburbia. In the non-existent perfect world, I probably would have left New York five years sooner than we did. A troll-like blogger who used to read wmtc (and maybe still does) was appalled that we left New York City for Mississauga. * He loves New York City and hates Mississauga. Sure, for a vacation, who wouldn't? Or if you're in very wealthy, you'll have a much richer and more rewarding life in New York than you will in many other places. And I don't belong to the "New York is a nice place to visit but I wouldn't want to live there" school. It is a great place to live. But unless you're very rich, not forever. I wouldn't argue city vs suburbs. That's a lifestyle choice, and what works for one person doesn't work for someone else. When I lived in New York, people thought nothing of telling me my hometown was dirty and dangerous. I didn't gratuitously tell people their suburban enclaves were ugly and boring - although to me, at that time, they were. The city was everything to me. Now, driving around to Linens 'N Things and Canadian Tire and sitting in my backyard are divine. * His first comment began: "I just found your blog. I can't wait for the part where you discover you're the dumbest couple in North America." He's been banned - and mystified as to why - ever since. "quietly claimed sweeping new powers"
"political opportunism and rampant self-interest"
"we had to fire no matter what"
"the impresario of unnecessary violence"